Hey kiddies, it’s that time of year again – Boston Springs A Fethival 2019 is FINALLY HERE! And this year, we have a relatively new festival joining our coverage – it’s the Global Cinema Film Festival of Boston! And once again, this “Boston” festival isn’t actually in Boston, but in Belmont. Well, at least that’s keeping with other local “Boston” fests, isn’t it? HA HA! Day three of GCFF is a full day of film and festivities – you’ll find today’s schedule below – click on the links for full show information and ticket information – but buy your tickets EARLY – these shows have a history of selling out, and you don’t want to miss out! Be sure to step up and help support GCFF, because they have some utterly great features for you! And as always, if you don’t have a pass, but have tickets, get in line early – and there will be a rush line for all films if any tickets are still available. Studio Cinema in Belmont, home to the GCFF this year, is located at 376 Trapelo Road in Belmont – one of the true indie cinemas still left in the metro area, and a perfect place to hold this kind of festival! Don’t forget to check out the festival’s official website for full info on this weekend’s fare! 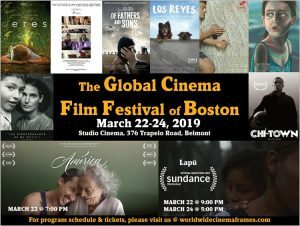 And with today’s screenings, Global Cinema Film Festival of Boston calls it a wrap for2019! We’ll also be covering GCFF and the other NINE festivals and film series that happen in greater Boston between March 1 and May 1 every year coming up in late May on our two part “Boston Springs A Fethival” episodes of eCinemaOne‘s Subject:CINEMA podcast!